I had wanted to fly ever since I first read Captain WE Johns’s tales of James Bigglesworth of the Royal Flying Corps. I took my private pilots licence in Cornwall, when I moved to Dorset and started to fly Tiger Moths, I was in absolute heaven ! Quite by chance I flew with a friend in a Bucker Jungmann (of similar age but of German origin) and fell in love all over again. 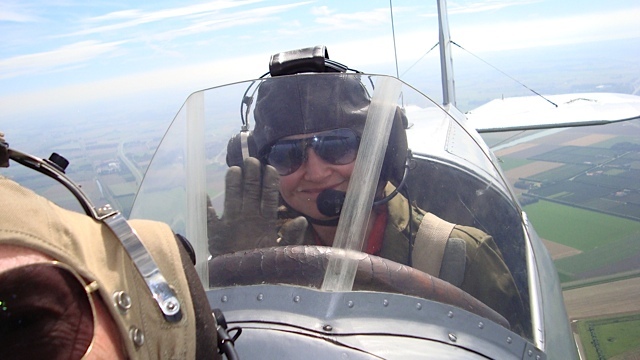 After many hours of practice I started competing in aerobatic competitions and was one of only a few women who have gained a DA, a display rating ,allowing me to show off the qualities of my highly aerobatic aircraft at air displays in Britain. With two other friends I embarked on a joint build project of an RV7 ,an all metal 200 horsepower side by side tourer capable of flying for 5 hours plus at 150 knots/173 mph. I have flown to the northern shores of Scotland and to the Baltic along with hops to Holland and France. Born and educated in South Africa where my abiding memories were sitting on our roof watching the first Vampire jet trainers flying over our house from the nearby central flying school and my first dinghy sailing in a “Sprog” This was the introduction to my two passions in life-sailing and flying. Left Wits. University for the UK in a Volkswagen Beetle and, with a young Swiss accountant, drove up through Africa to Liberia (a long ,long, long story!) then worked my passage on an ocean going Tugboat to France, then Dublin and finally to Swansea on a small coaster . After washing tons of dishes in Earls Court joined the Royal Navy in 1960 . Joining the Fleet Air Arm was the first step in following a career which would allow me enjoy these passions to the full. I first flew a Tiger Moth at Dartmouth Royal Naval College (Roborough) in early 1960 and came away with an enduring affection for these iconic aircraft. After Dartmouth RAF Linton on Ouse where I continued my basic training on Jet Provosts. Having gone solo I was looking forward to flying Hunters and Sea Vixens when my leg was severely damaged in a “young officers expedition”. This put paid to my piloting ambitions. The navy offered me a choice, a disability pension or becoming a Sea Vixen observer-being “young and foolish ” I opted for a career in the “coal hole”. Night deck landing at sea on HMS Hermes and Centaur was an interesting, if aging, experience !. Last posting was at Yeovilton as an observer instructor on Sea Vixens. On leaving the Royal Navy I entered industry with all my leisure time being taken up by boat building and sailing. This lasted for around 30 years of racing and cruising concluding with a couple of trans-atlantics. I resumed flying in 1995 first with microlights then on to a PPL(A),IMC and aeros. After building and flying a number of “homebuild” aircraft (RV6,Sherwood Rangers and a Starduster) I became caught up in the Tiger Moth restoration and flying world which culminated in the restoration of the six Tiger Moths. After selling three I decided to keep three and set up “Tiger Moth Training” to ensure that the Tigers could pay for their basic costs and remain flying at Henstridge. My current activity is restoration of Gipsy Moth G-AANO . I am the “oily rag” maintenance man of the school and, of course, continue flying the Tigers. My PPL started with the Cambridge Flying Group and Bill Ison was my first instructor, completed it at Thruxton seven months later being examined by Barry Dike,issued in October 1977. I bought a small share in an Auster, G-AIBX, based at Panshanger and this aircraft is still airworthy. My target was to fly an hour a week for three years to get 150 hours in command (P1) so to be able to go on an instructors course. I had been a schoolmaster but found I could earn more as a petrol pump attendant to pay for my flying ! I then became an Assistant Flying Instructor with the London Flying School in 1980 based at Elstree…..barely had enough cash to survive…but I was very happy flying. A year later I had sufficient hours and experience, as well as how to teach instrument flying and aerobatics, to become a Qualified Flying Instructor. Now I could send my own students ,and others, for their first solo. Exciting times and great camaraderie. I have been instructing ever since ,with civilian flying clubs and airline colleges, both here in the UK and abroad. I have also worked with the military. My interests and activities widened as I have had the good fortune to test fly homebuilt aircraft on behalf of the LAA, fly aerobatic displays (just starting my 21st season),write aviation articles and fly a host of diverse aircraft types. I have been very fortunate to have met so many interesting and passionate people involved with flying . I have flown aircraft such as the Sopwith Camel, Fokker Triplane , Spitfire, Hurricane and the superb Russian fighter the Yak 3.In all I have 11,500 hours on 182 single engine piston types. I still delight in flying the worlds best basic primary trainer, the Tiger Moth. When I first flew with Bill Ison I didn’t realise how good and challenging it was and how it still remains. It responds to a delicate touch and brings out the best in an understanding pilot. It is my default aircraft and keeps me ready for any other. Long live the Tiger Moth ! Perhaps the best pilot trainer in the world ! Jim Norris is a former Royal Navy Engineer Officer who has served on Sea Harrier and Lynx squadrons during his naval career. Currently, his day job is to provide specialist contractor support to MOD Air Domain airworthiness programmes, and is currently helping to introduce to service the UK’s brand new P-8A Maritime Patrol Aircraft. 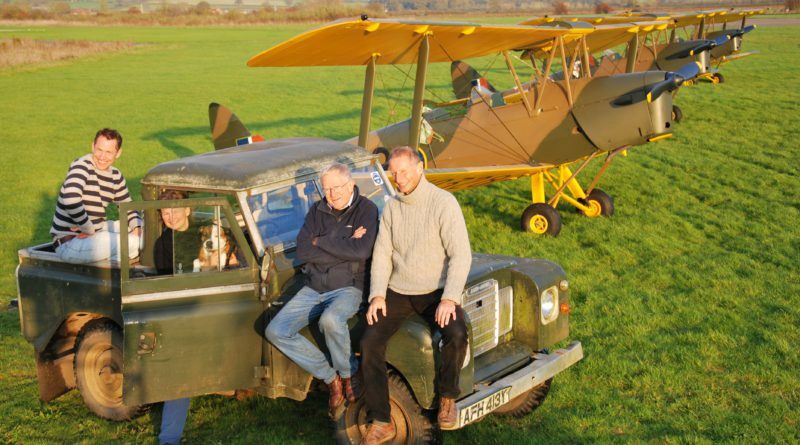 Jim’s life-long fascination with ancient machinery led him to join the Tiger Moth fraternity 4 years ago. He owns G-ALWS , which he keeps stabled with the rest of our fleet. After regaining his long lapsed PPL under the tutelage of Tiger Moth Training, he now regularly flies with family and friends at weekends. 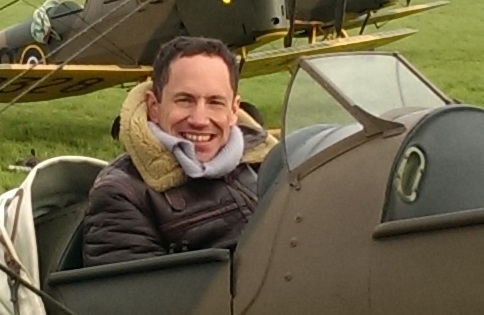 While he loves flying, he says his greatest pleasure of Tiger Moth ownership is to be found in simply tinkering with bits and bobs in the hangar. 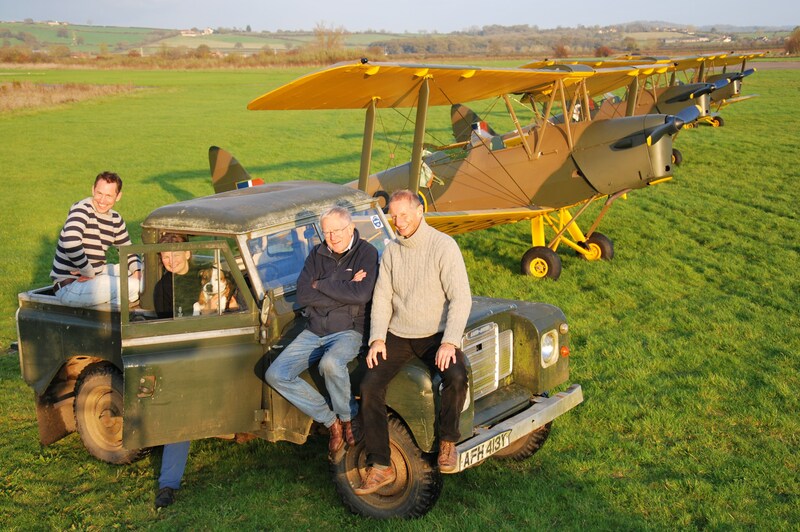 We were all very pleased when Richard joined us in 2017 and is in effect the Czech branch of our Tiger Moth “family”. He is a family man and a professional pilot running Aeropartner a charter airline located at Prague International Airport operating a fleet of Citation business jets. He has a huge respect and passion for the RAF (including the Czech pilots)for what they achieved in World War 11 and this is illustrated in his own life, business as well as private. As a RAF enthusiast and promoter of the historic heritage of Czechoslovak exiled airmen, he has his own pilots dressed in uniforms and insignia reflecting those worn by RAF and Czechoslovak pilots during those wartime years. This affection goes even further with his international air carrier three letter code being DFC. There were of course many Czechoslovak pilots who won the Distinguished Flying Cross for their outstanding contribution in defeating the Luftwaffe. 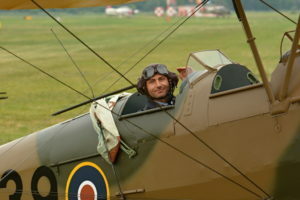 Richard’s No 1 hobby is his fleet of vintage aircraft that he operates out of Podhorany airfield(LKPN) Czech Republic. 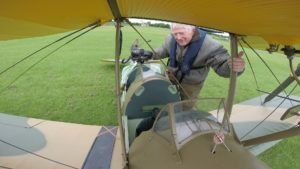 His two immaculate Tiger Moths(which were restored at Henstridge) are his flagships and proud arm of Tiger Moth training UK.